I've just been reading a symposium of a study of arms and armour in the norse literature. The study itself very old, from 1914, and originally writen in german, by Hjalmar Falk, a norwegian historian/linguist. While Falks own interpretations are sometimes dubious, he has diligently read most of the available source material, and list all the major types of arms and armour that shows up in these. Brynje (Mail) and Panzar (gambesons) are by far the most common. Plata (coat of plates) is mentioned a number of times in the 13th century. Most interesting to our current debate, however is "Spangabrynje"
Spangabrynje is only mentioned a couple of times in the source material. A "Spong"/"Spang" is a small metal plate; the same as Lammelae. (the same word is the basis of "Spanghelm"). So directly translated; small plate mail. 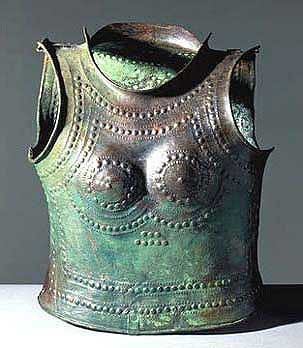 It is taken to reffer to lammelar armour, of the type found at Birka, but could also refer to scale style armour, wich could also be covered by this definition. After all, a scale armour is still made of small metal plates. So we don't really know. Matthew, since you are one of the few people in the last 3 millenia to have made and worn a boar's tusk helmet, how do you rate its defensive qualities as a piece of armour? My guess is that it was pretty good. The ancients seem to have liked it, which is generally a safe way to judge. Aside from the fact that I'm not really inclined to let someone whack me in the head while wearing it, I honestly don't know how close to the real thing mine might be in construction. There's simply too much guesswork involved. Homer's description is all we have for the foundation, and the way he emphasizes the crossing leather thongs implies that they made a more substantial layer than I have. We also don't know exactly what is meant by the reference to the felt part. And even though there are lots of boar tusk pieces surviving today, I haven't seen any detailed information on their thicknesses, nor can I be certain how much they may have overlapped. With all those variables, my helmet ends up being a good visual representation, but not much more. (Okay, a spectacularly good visual impression!) If you want to do some destruction tests, Boone Trading Company probably still has tusks, and I know guys with bronze weapons! The idea, of being hit over the head with a bronze sword doesn't really appeal to me either. Looking at yours and Peter Connolly's reconstruction again, I have a sneaking suspicion that the helmet's defensive qualities probably owe more to the multiple layers of leather thongs rather than to the boars tusks. Yes, the leather is definitely a factor, but those tusks are HARD! They were making sparks when I cut them on the bandsaw. The thinner parts are brittle, but again I'm not sure what the minimum thickness was on the originals. The combination of very hard scales on a flexible base might be tough to beat (though there's a lot to be said for RIGID head protection!). And it stays spiffy-looking without having to clean fingerprints off of it! Mostly because I have come into posession of a copy of Osprey Publishing's "Late Roman Cavalryman 236-565"
Practicing thread necromancy I see. I have come across something somewhere which says that those "cuisses" might actually be vambraces. Either way their construction does seem to be similar to the limb defences apparently being worn by gladiators, Parthian cataphracts etc. MOAOAOHAHA!!! Rise! Rise I say! The book also mentiones horse armour found at Dura Europos, wich I finally has found some pictures of! I'm bummed I didnt get involved in this thread back when it was a hotbed of activity...I could have added a lot of interesting comments....I wont even get into the viking scale/lamellar debate...Dan Howard can affirm I've gone into that at some length...I only wish I had the pages and pages of discussion about it on the Arador site. Norse gear is of special interest to me, as its my period of focus. I've done a lot of research and reading of the Sagas and other source material, contemporary accounts and the like, looking for abnormal arms and armour references. As Elling has already mentioned, the spangabrynja reference is extremely interesting. There are many other passages in the sagas that refer to armour that could possibly be something other than mail. I still hold that somewhere, at some point, a viking, or norse trader, or some other native Scandinavian acquired, by some means, a lamellar harness. We have no archeological evidence aside from the Birka find, we have no artistic evidence, and we have sketchy literary evidence, however, based on what I've read about the viking mindset, and given the interaction between vikings and their contemporaries, many of whom utilized lamellar armour, I feel it more likely than unlikely a viking or Scandinavian wore it within Scandinavia during the Viking Age. Some day I think I'll prove it....I'm always digging. 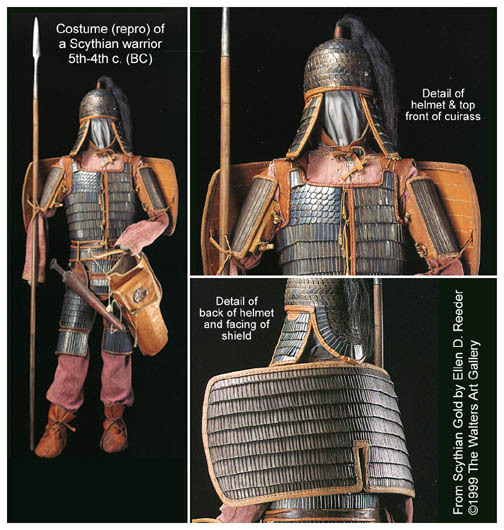 Now, that out of the way, everyone goes on and on about the standard body armour types...scale, lamellar, mail, plate, CoP's and brigandines...hardened leather...and it's always in a European, Middle Eastern or Oriental context....you guys don't give enough credit to the more primitive peoples of history who crafted some truly beautiful, bizzare, and effective body armour out of the strangest materials. "Violence might not be the answer, but it sure cuts down on the number of questions." 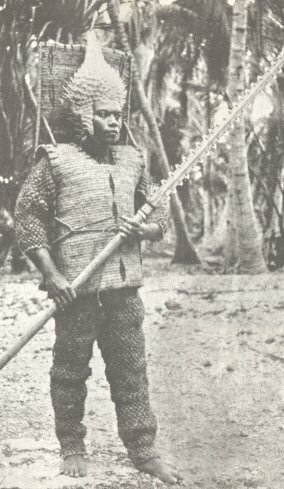 There's also a Banana fiber helmet from Okinawa, I dont have an image of it, but I believe Dan Howard does. If you check out the website the picture comes from, it says the scale fragment comes from Mainz. 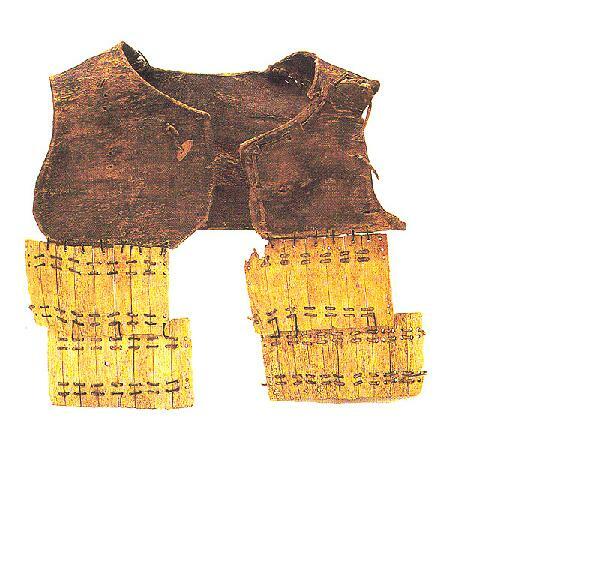 Neither the horse armour or the mainz fragment seems to have had a backing garment. The scales from Carlisle might have had, though. When it comes to the spangbrynje, we do not know what it looked like; it could have been a eastern style lammelar, or scale armour. The later are actually shown in some medieval sources at least in germany. And then the fun part begins. Archeologists left the site before they lifted the lames of the armour up, so it was left unprotected and with minimal security (a guard should check the site now and then). Well, some Einstein had seen it or overheard the talk of archeologists of their "precious find", got onto the site and amateurishly tried to lift up the remains of the armour. Of course it broke to pieces, so he left without his "treasure". Archeologists said that the damage was not unrepairable. It's apparently mid 6.th century frankish lammelar armour. Franks were present only about 7 years on the territorry of modern Slovenia before the Slavs arrived in late 6.th century, but they left behind a large number of valuable objects. The photo doesn't help. How do you know it is lamellar and not scale? Very few archaeologists know the difference so it is unwise to repeat the terms they use. Well, I don't know. 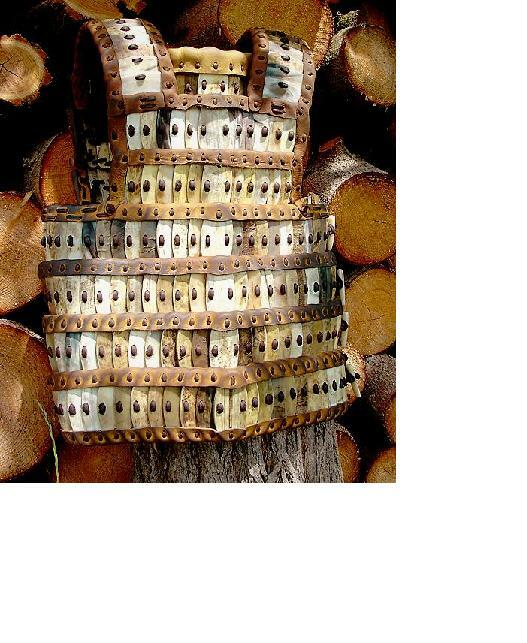 As far as I could see it on TV it looked as lamellar to me - pieces of armour were big and with several (lacing?) holes. But it was hard to discern, pieces were corroded together. It could be just scale. 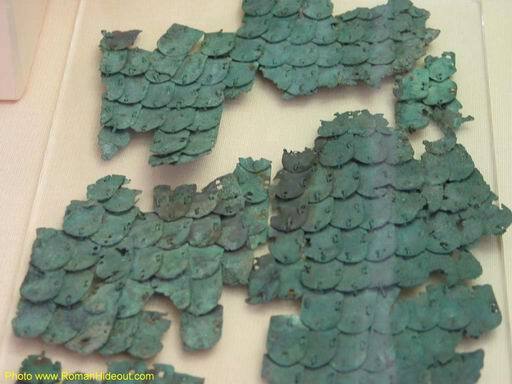 But I know of at least one other find of Frankish lamellar armour from such an early period, but I can't find the referece now. You're right, it's not safe to just repeat the phrases some of the archeologists say, not to mention journalists. It was in all the paper and on TV that the item the vandal destroyed was the "Frankish shield". hmmm.... correcting myself. The horse armour has backing. The Mainz Squamata fragment does, however seem to be without. Hey, folks! Just wanted to chime in here with my own info on lamellar type armours. First: I think most, if not all, scale or lamellar type armours have some sort of backing, often leather or cloth. The only theoretical exception is the bakhterets-type, because the plates overlap (which is one of the requirements, I suppose), but that belongs in its own section, mail-and-plate armour. Second: My understanding of the differences between the two is that the scales on scale armour are connected either through the backing (that is, each individual scale is attached to the backing and naught else), or vertically through each other, as in the klibanion. Lamellar, on the other hand, is connected in a left-arm to right-arm fashion (because most attacks will be coming from your left, making it a more effective glancing surface), and vertically to a lesser extent, or not at all. Third: Their disappearance, in my opinion, had to do with their weight when compared to plate armour. 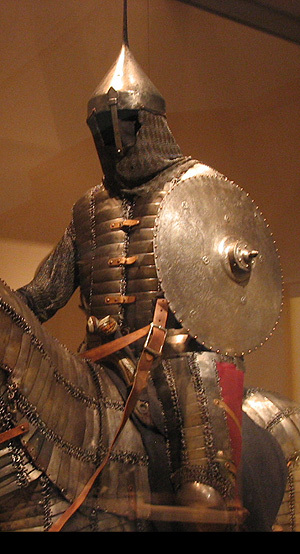 Increasingly in the Middle East, Turkey, and Russia plate-and-mail (plate being the primary component) armours became more common, or purely plate armours. Lamellar armours, from my understanding, were quite heavy (makes sense considering all the threading, overlapping plates, etc) but gave exceptional protection. With the rise of plate, the exceptional protection was given without the added weight. My main source for these conclusions comes from a book which includes a number of essays that deal with the subject. Companion to Medieval Arms and Armour edited by David Nicolle. I've included a pair of klibanion images from the book.. Partially because I think the armour is really cool, and partially to better illustrate the construction. 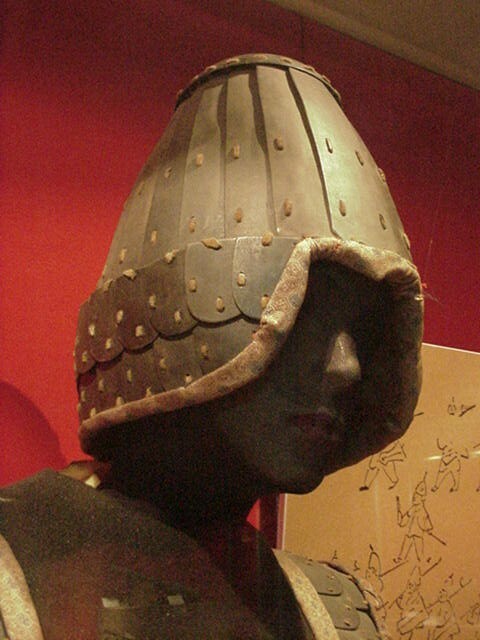 Another leather-backed armour is the kalantar'. It's basically a coat of plates, but the plates are on the outside. An example on the right That, along with a good hauberk and some leg and arm defences would make my day. Nicolle often confuses scale with lamellar. He can't be trusted to distinguish the two correctly. Robinson does this also in Oriental Armour but tightens up his definition in his book on Roman armour. 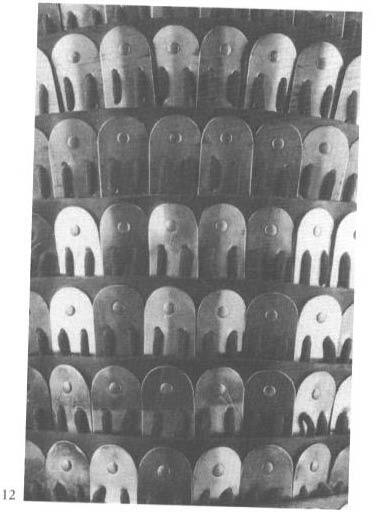 Scale armour consists of small overlapping plates fastened to the foundation. The direction of the overlap or the shape of the plates is irrelevant. Lamellar consists of small plates laced or wired together in such a fashion that no foundation is required. 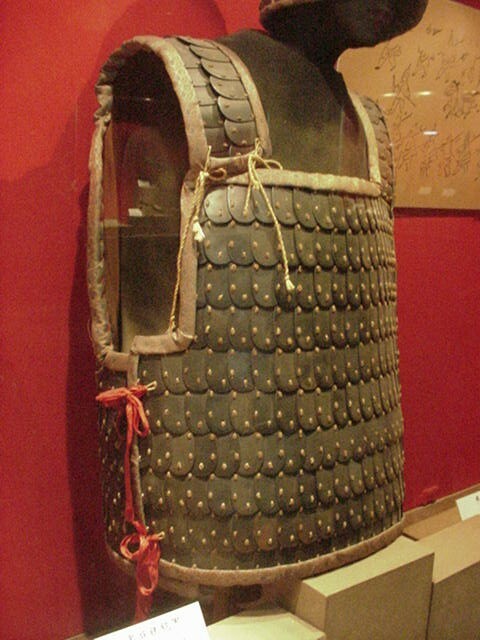 Sometimes the lines are blurred, for example in "locking scale" armour where the scales have additional lacing to reduce flexibility and improve protection. Locking scale is often confused with lamellar. Here is Simon James' definition: "Lamellar differs from scale in structure in that the small plates of which it consists are not dependent on attachment to a cloth backing, but are attached directly to each other." (from his "Final Report of Dura Europos, p.123). 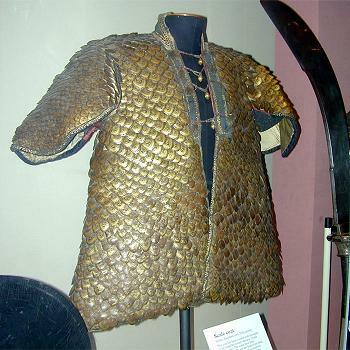 Farrokh (middle eastern armour scholar) gives a similar definition: Scale armor was made of small metal scales laced horizontally onto a backing material so that the scales would overlap. 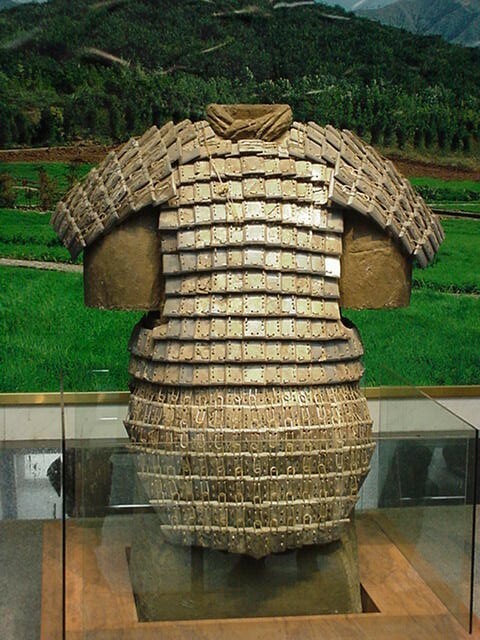 Lamellar armor is made of small rectangular plates, of iron, bronze or leather laced together vertically or horizontally with no backing material. There was true lamellar found at Dura Europos and there is plenty of lamellar in Asia dating back at least to the Warring States period. Albert E Dien is the best source for this period. There is no evidence for true lamellar dating earlier than this. 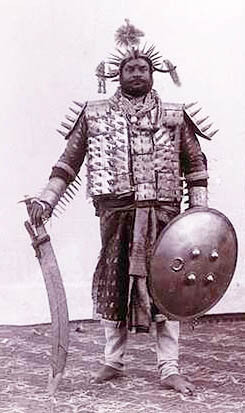 Earlier examples, such as Assyrian armour is scale, not lamellar. That was, actually, my own distinction between the two from observation. Upon further review of it, however, I noticed that the Dura Europos armour overlaps vertically as well as horizontally. I agree with Simon James' definition, because he allows for the possibility of an attached cloth backing, but not a dependence upon it. 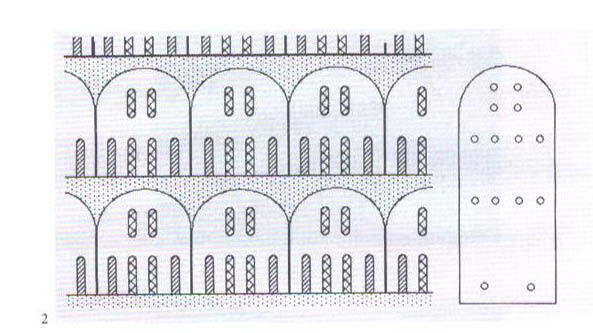 As a side thought, are there many examples of the plates in lamellar being connected by wire? I've never seen an example and it sounds quite unusual to me, especially because of the labour that would be involved. Phew! The book was edited by Nicolle, with one essay by him (pertaining to this very subject, as a matter of fact), so I have information from other writers. However, I too have some level doubt regarding his expertise in this particular matter (and a few others, but that's not for here), so I'll take it with a grain of salt. The only examples of wire I can think of are the staples used by the Romans. The scales are fixed to a backing so ithe armour could be defined either as "locking scale" or lamellar - depending of whether the foundation offers any structural integrity.